Chang Koehan (Korean: 장거한, Japanese: チャン・コーハン), is a criminal under rehabilitation and one of the recurring members of the Korean Team in the King of Fighters series. In Korean, 'Koehan' means "giant man". He was once a feared and violent criminal in Korea. He was spotted by Kim Kaphwan from a prison's surveillance footage and he wanted to use Chang's strength "for justice". 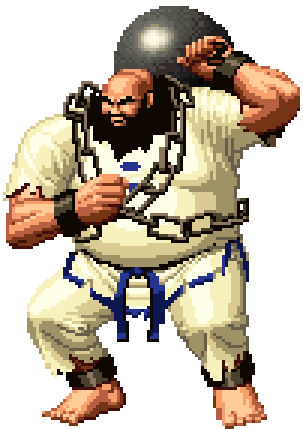 Though Chang easily broke out of prison, he was caught by Kim and forced to undergo Kim's "Rehabilitation project" starting in KOF '94. During this time, he befriends a fellow convict who was also caught by Kim, Choi Bounge. Together, they initially schemed for ways of escape but they eventually mellow out and enjoy their companions' company -with protests saying otherwise. This page was last edited on 21 November 2008, at 18:24.